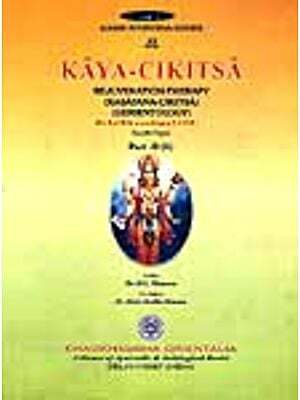 This book has attempted to build a platform for sports medicine by taking maulika siddhantas of Ayurveda. 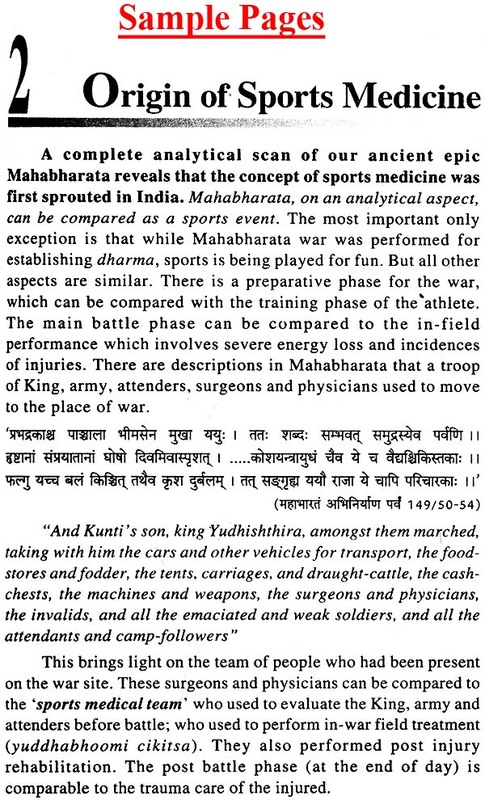 It is unique of its kind which highlights the concepts of sports medicine elaborated in Ancient Indian Epics and Ayurveda based on guna siddhanta. 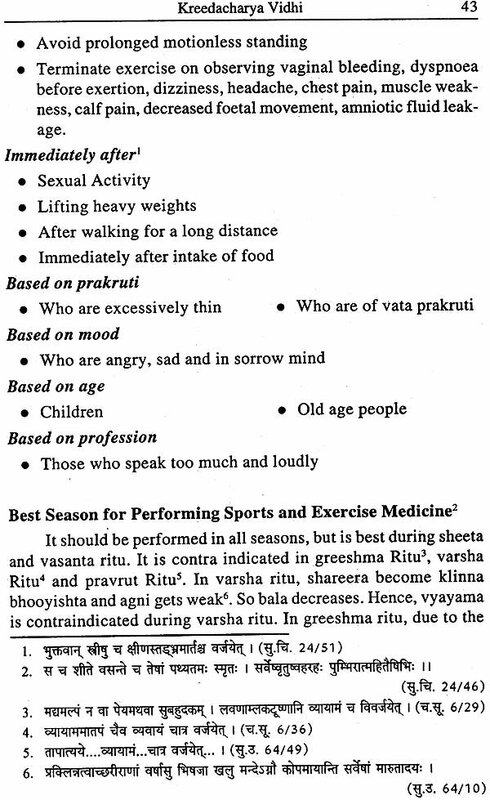 Based on these siddhantas, the physiological changes in the body of a sports person, his Dinacharya Vidhi and Manasika A vasthas have been highlighted. Light has been thrown on elucidating the scientificity of Traction, Rehabilitation etc. mentioned in Ayurveda. Dr. Praveen Balakrishnan is presently working as Research Officer (Ayurveda) at Regional Ayurveda Research Institute for Eye Diseases (CCRAS), Lucknow. He had completed his graduation from Pankajakasthuri Ayurveda Medical College, Trivandrum and post graduation in Shalakya Tantra from Shri Dharmasthala Manjunatheswara College of Ayurveda and Hospital, Hassan. He had worked as Assistant Professor in Vishnu Ayurveda College, Shoranur for couple of years. He has received Late Paranjape Award in 2012, Vaidyaratnam P.S. Varier Award two consecutive times (2013 & 2014) and Vaidyaratnam ET Neelakanthan Mooss Award in 2016. He had published two books and two journals. Namaste to all vaidyas. This book aims at enlightening the glimpses of various concepts of sports medicine mentioned in Ayurveda and Indian sciences. Sports medicine is gaining enormous importance and recognition in the present world. The contemporary science has now recognized it as a separate super-specially branch of medicine. It deals with various phases of sports activities right from the diet, routine practice, exercise and life style of an athlete to the management of injuries and its rehabilitation programs. Ayurveda can contribute a lot to the field of sports medicine. All these phases of a sports person have to be critically studied through the foundation stones of Ayurveda. This book, 'Concepts of exercise physiology and 'sports medicine in Ayurveda, has attempted to build a platform for sports medicine by taking the foundation stones of Ayurveda Maulika Siddhantas. The book can be arbitrarily read in three sections. The first section deals with basics of sports medicines. 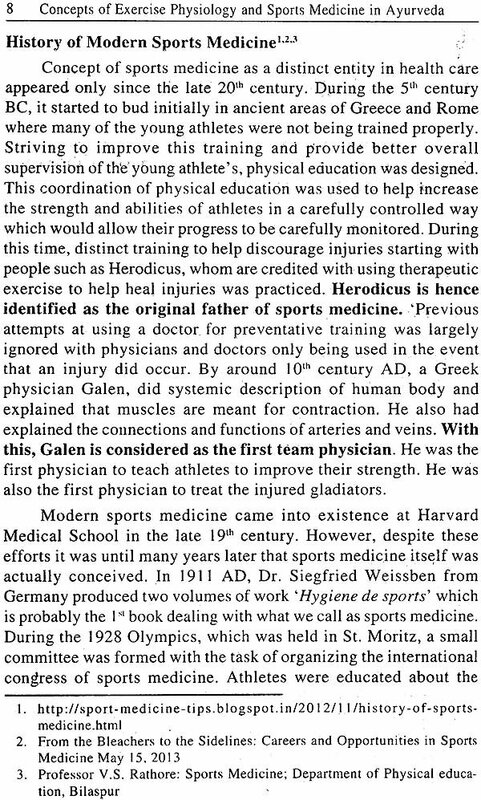 Light has also been thrown on first description of sports medicine in the world, i.e. the Mahabharata war. 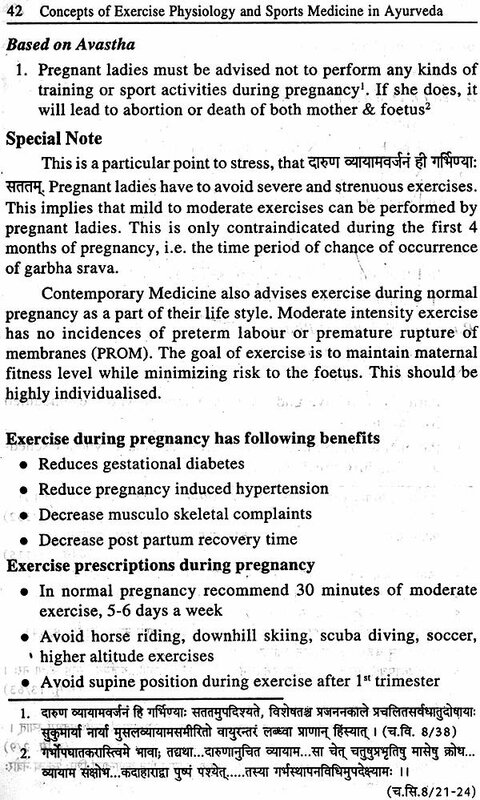 Second section deals with Ayurvedic understanding of physiology of sports person, his advised lifestyle and mental status. It also deals with sports injuries mentioned in Ayurveda and its management .concepts. Specific importance has been given on highlighting the concept of resistance rehabilitation in Ayurveda. The final phase deals with usage of sports as a treatment schedule in various diseases. This book shall help to be an eye opener in understanding the concepts of sports medicine in Ayurveda and pave way for further researches and development. Every human being loves one or other form of sports. Some may be interested in running activities, some in football while some in archery. These kinds of sports bring in a source of enjoyment, help humans to build and nurture relationships and make them healthy. These different kinds of sports activities are being done from the childhood days. They are continued even till old age until further physical activities cannot be done. Hence, sport is an integral part of life. During the ancient times, these kinds of sports were done only for fun among the neighbouring people. Later they were slowly made into competitions with some rewards. These individualized competitions were then widely distributed. Later national and international events sprouted up. Globalization and commercialization salted the sports arena. Many people started taking sports activities as their profession, They practice it regularly and perform on the ground during the events. These professional people are being considered as 'Gems of the Nation'. They represent the nation during huge events. Nation's victory lies in their hands. Hence, the sports concern which was merely an individualistic or a small group performance has been transformed into a nation's pride. These sports people hence undergo a different lifestyle when compared to other normal humans. Continuous training sessions, prelims, selection rounds and repeated practice has become a mandatory part of their life. They do this for achieving victory for themselves and for the nation. Hence, they need to have quite a number of changes in their life style and nutrition. 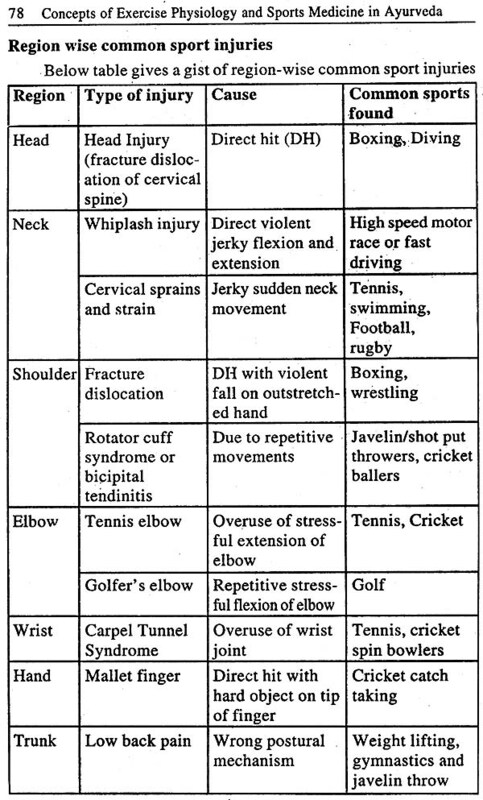 They are also liable for facing many injuries during practice or in main competition. They may also have chances for developing some other physical problems due to their repeated training programs throughout the year until they retire. So knowledge regarding their health physiology, its related issues, nutrition and management of their medical conditions is very essential. This is of extreme importance as losing a 'gem' of a nation is as equivalent as nations defeat in the events. This has lead to urge an importance for the medicine in field of sports. The word, formed from old French word 'disported or deporter or disport', was coined around 14th century. It means to divert, to please, to play or to amuse. It also means to take pleasure or to amuse oneself. In late 15th century, it was defined, as amuse oneself by active exercises in open air or taking part in some game in a restricted sense. Sports is defined as an activity involving physical exertion and skill in which an individual or team competes against another or others for entertainment. According to Cambridge Dictionary, a game, competition or an activity needing physical effort and skill that is played or done according to rules for enjoyment and or as a job is called as sports. A person who is proficient in sports and other forms of physical exercise is called as an athlete. The word athlete has been derived from the Latin word 'athlein' which means compete for a prize. Hence, an athlete can be called as a person who is proficient in sports and other forms of physical activity and who competes for prize. 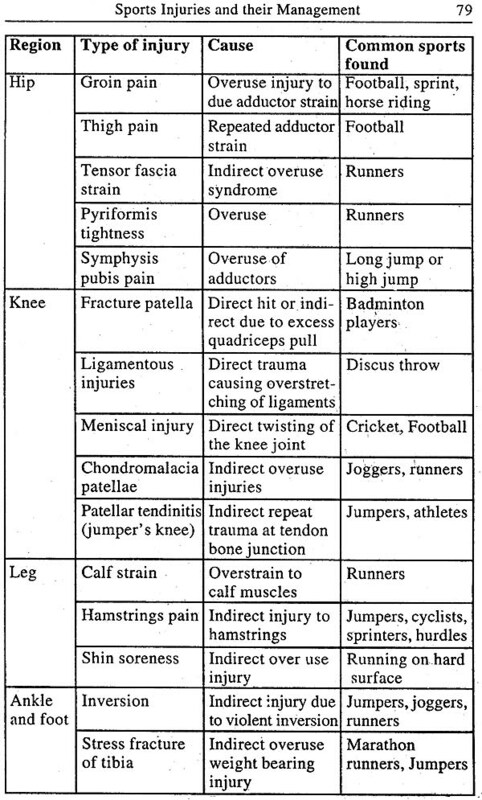 Sports Medicine is also called as Sports and Exercise Medicine (SEM). It is a branch of medicine that deals with physical fitness, treatment and prevention of injuries related to sports and exercise. 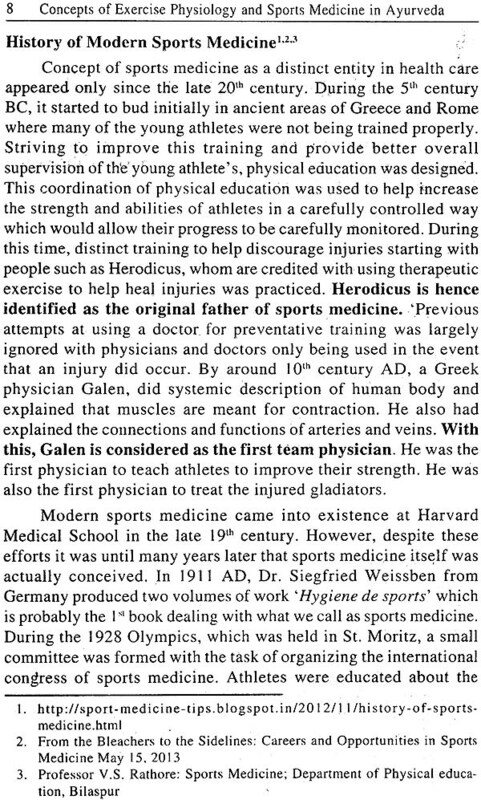 Although most sports teams have employed physicians for many years, it is only since the late 20th century that sport medicine has emerged as a distinct field of health care.